Mark Pawsey, MP for Rugby, officially switched on Rugby Town FC’s brand new floodlights ahead of Saturday’s Midland Football League game against Worcester City at Butlin Road. The new system was installed after the club received a £29,552 grant from the Football Stadia Improvement Fund (FSIF) – the largest funders of non-league football in the country, with the club matching this total from its own funds and contributions from individual supporters. The MP was joined by the Mayor of Rugby, Cllr. Belinda Garcia. The state-of-the art floodlight system has replaced Town’s previous floodlights, which had been installed over 30 years ago and were no longer fit for purpose. They will benefit not only the club’s first team squad, but also its youth team – who are members of the Midland Floodlit Youth League and the club’s developing junior structure. 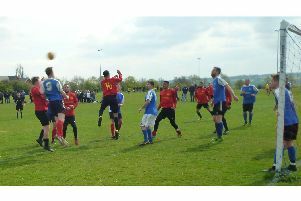 The site is also used by the Rugby and District Football League for Cup finals, as well as for Warwickshire County Cup fixtures for the local schools. This is the second grant Rugby Town FC has received from the FSIF. Previously, the club were also awarded funding towards the development of a new hospitality and function suite following the refurbishment of their old changing rooms in 2013. Mark Pawsey, MP for Rugby, said: “It’s an honour to switch on Rugby Town FC’s new floodlights for their official unveiling, and I’d like to thank them for inviting me to do so. The club is an integral part of the community here, so it’s great news to hear of how this stadium upgrade is going to benefit not only its first team, but also its youth players. Michael Yeats, Club Director, said: “The grant provided by the FSIF for the installation of new floodlights was very important for the club moving forward. It further enhances the stadium facilities by replacing an ageing floodlight system and enables the club to be well placed to seize every opportunity in the future to progress upwards in the non-league pyramid. Peter McCormick OBE, Chairman of the Football Stadia Improvement Fund, said: “I am very pleased to hear of Rugby Town FC’s latest stadium upgrade, in the shape of their brand new floodlights. The flexibility and improved safety provided by the new lighting system will have such a positive impact on the club, which is already working hard to offer opportunities to local people via the game.